Consciousness is non-physical, it does not emerge from matter, it can’t and never will emerge from matter. Consciousness inhabits any system capable of sustaining it, if it provides opportunity for entropy reduction. Consciousness is a living information processing system and it reduces entropy (a measure of disorder or chaos) in order to grow and survive. Everything left alone will always gradually increase entropy and finally evaporate to chaos (random data). 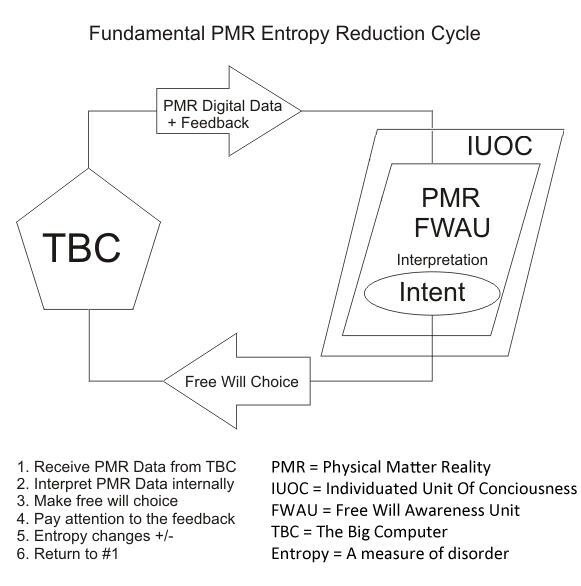 You are the systems strategy to reduce entropy by interacting with other consciousness units. This interaction creates feedback, content, meaning, value and drives evolution to create novelty. The you in this reality is called a Free Will Awareness Unit (FWAU). You receive an information data-stream that you interpret as this reality and it presents you with choices. You use your intent to make your free will choices and those are then evaluated by the system to be either entropy decreasing or increasing. Free will is the ability to choose from the options withing your decision space. The system adds feedback to your data-stream so that you can evaluate your choices. It’s up to you, the system does not meddle unless it can help you reduce entropy. When the system helps we call it serendipity or synchronicity. The system will assist everybody that demonstrates being on a growth path and it sometimes injects data to indicate the path. The reason is (did you forget already) you are the systems strategy for entropy reduction, as you reduce your entropy, so too does the systems entropy. You always interpret everything so everything is subjective, even the objective is subjective because you are still interpreting data. Objective is merely approximately or statistically objective. Information is interpreted data, you are that which interprets data, otherwise known as consciousness. Below is a schematic flowchart of the fundamental cycle you are running.